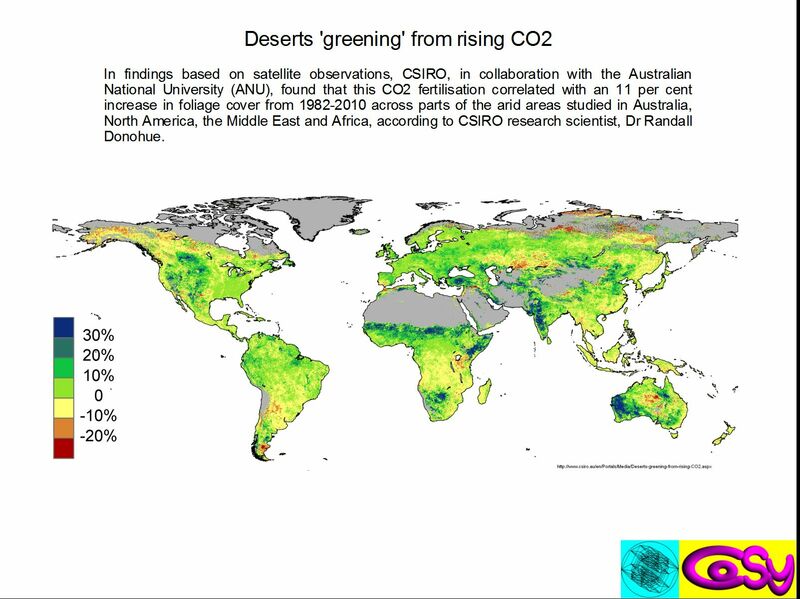 Study: increased carbon dioxide is greening deserts globally | Watts Up With That? The positive trend in vegetation greenness has been observed through satellite images, but the reasons for it had been unclear. After analyzing 45 studies from eight countries, Lixin Wang, assistant professor of earth sciences in the School of Science at Indiana University-Purdue University Indianapolis, and a Ph.D. student in Wang’s group, Xuefei Lu, concluded the greening likely stems from the impact of rising levels of atmospheric carbon dioxide on plant water savings and consequent increases in available soil water. In some regions, greening could be caused by species change, with greener invasive plants replacing indigenous ones or bushes encroaching on grasslands that are used to graze cattle, Wang said. Defined broadly as zones where mean annual precipitation is less than two-thirds of potential evaporation, drylands are the largest terrestrial biome on the planet, home to more than 2 billion people. Recent regional scale analyses using satellite-based vegetation indices such as the Normalized Difference Vegetation Index have found extensive areas of dryland greening in areas of the Mediterranean, the Sahel, the Middle East and northern China, as well as greening trends in Mongolia and South America, according to the paper. Lu and Wang considered other potential drivers that could have caused the greening, including increased rainfall and changes in land-management practices. But only carbon dioxide provided a global explanation for changes to dryland vegetation. To date, the global average concentration of carbon dioxide in the atmosphere has increased by nearly 27 percent between 1960 and 2015, with the expectation of a continued rise in years to come, according to the researchers. The researchers believe the greening is a response to higher atmospheric carbon dioxide inducing decreases in plant stomatal conductance — the measure of the rate of passage of carbon dioxide entering, or water vapor exiting, through the stomata of a leaf — and increases in soil water, thus enhancing vegetation growth. The researchers examined the sensitivity of soil water change to varying levels of carbon dioxide, finding a significant positive change in soil water along the carbon dioxide enrichment gradient. “The stability of the rate of change justifies using higher carbon dioxide enrichment levels to interpret soil water responses to currently observed carbon dioxide enrichment,” Wang said. The analysis also showed that elevated carbon dioxide significantly enhanced soil water levels in drylands more so than it did in non-drylands, with soil water content increasing by 9 percent in non-drylands compared to 17 percent in drylands, Wang said. Determining the mechanisms of stronger soil water responses in drylands will require further investigation. Studies including Wang’s earlier work in Africa have shown that even small changes in soil moisture in drylands could be significant enough to cause large changes in vegetation productivity. Going forward, Wang said, the positive effect of carbon dioxide-induced water savings may eventually be offset by the negative effect of carbon dioxide-induced temperature increases when the temperature increase crosses a certain threshold. Another author of the paper is Matthew McCabe, an associate professor from King Abdullah University of Science and Technology in Saudi Arabia. February 16, 2016 in Positive effects of CO2. Some people just aren’t happy unless they are pessimistic. 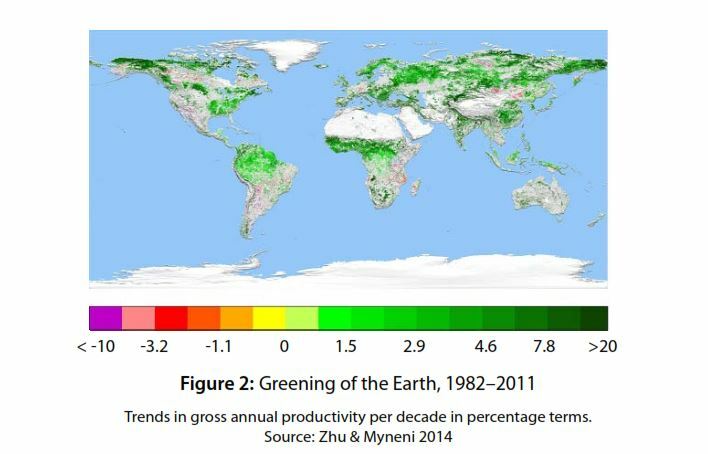 My pet troll David Appell always responds to any post I make mentioning the earlier image , http://cosy.com/Science/AGWpptDesertGreening.jpg : “What’s so good about a greener planet?” . It wouldn’t be the first time that deserts were green, would it? Jay, SW USA, during Roman Warm. Appell is a real peace of work. Act now! Get WWF to start a campaign to save the deserts and their myriad wildlife. In the UK we get their TV ads to adopt a snow leopard or whatever – text now to donate! Would that work for deserts? Yup. Children just aren’t going to know what deserts look like anymore. m. hart…..your grey matter is increasing. They can’t get funding if they don’t have a problem to solve. These “last words” will surely guarantee future research Grant monies. Wang said, the positive effect of carbon dioxide-induced water savings may eventually be offset by the negative effect of carbon dioxide-induced temperature increases when the temperature increase crosses a certain threshold. Hey! A new speculated tipping point! Based on whose physics? Let’s take Wang’s less speculative physics and apply it together with observations (real data) to future climatic conditions. Notice something (Wang did) – If the CO2 goes up 27% the soil moisture goes up about 2/3 of that. The region is defined as having rainfall less than 2/3 of the evaporation potential. So when the CO2 rises high enough, the rainfall will not have to increase (something we are, in addition, promised by models) in order to push the ‘dry lands’ into a different, wetter, more productive climate zone classification. (479-315)/1.52) +1960 = 2068 A.D.
As the CO2 has been observed to be rising faster than 1.52 ppm/yr at present, 2068 is latest the tipping point will be reached. If the atmospheric CO2 concentration rises above 479 ppm the land upon which 2 billion of the poorest people on the planet live will be permanently transformed from dry lands into farm and grazing lands capable of supporting more animals, more people and consequently a greater urban population. Any additional rainfall caused by any accompanying temperature increase will bring the tipping point forward. Children just aren’t going to know what a population bomb is anymore. Crispin in Waterloo, nice to read your way of thinking. It might well be a very good thing if we take advantage of it. His subsequent involvement in the 2009 “Climategate” controversy at the University of East Anglia (he was referred to in the hacked emails over 100 times) emboldened the sceptics further and changed global opinion: the number of people who believe man is responsible for global warming has fallen. The influence might not be positive, but there’s no doubt he has shaped the debate. “Exploited”? As in telling the truth? That kind of exploitation? There, fixed it to help ensure truth in advertising when begging for more grant money. oops…misplaced slashes won’t turn off bold. Well I have been trying for years to turn my back yard into a desert, using the finest grade of Roundup that money can buy. But this summer (California gets summer early), my back yard is flush with so much green, that I think I am going to ask Monsanto for my money back. I don’t know how much of it is native and how much is genetically modified species, but it all looks like weeds to me. Maybe they are correct it is the CO2 wot dunn it ! Yeah. We decided to kill our turf in SoCal and replace it with drier plants. Normally, we get 10 inches a year, less than a quarter inch between June and October. We got 5 inches last summer, which is more than the annual amount we’ve gotten in the past four years. So, yeah. It took A lot of Roundup, and then a skiploader on a garden tractor to get rid of what was left. A lot of people were tearing out their yards and decorating with rocks. For whatever reason, the green slightly brown grass is cooler, and it’s less dusty. Weeds do grow in the rocks which makes it look pretty bad. Surprisingly the rocks wash away when it rains, the turf does not. After much discussion we kept the turf. It’s looking pretty good now. Contrary to Monsanto’s assurances, non-GM species build up glycophosphate resistance rather quickly. Herbicide-resistant noxious weeds fertilized by CO2 = potentially bad juju. Unless Monsanto et al. then come up with new herbicides and GM crops designed to resist them (and industrialized farming concerns are willing to purchase both again), might could take a really bad drought to kill ’em. Ain’t no free lunch on this here rock. What’s “glycophosphate”? A frost resistant fertilizer? I’m wondering where the term “glycophosphate” comes from, when referring to “glyphosate”. There’s no hint of glucose in the molecule; nor phosphate. Phosphonate, yes. All I found with Google was anti-glyphosate sites using the term “glycophosphate”. My mistake, Roundup is glyphosate … I’ve been reading it wrong all this time. Thanks for the correction. Essentially, there seems a better chance of several weed species becoming more competitive than crop species in a CO2-rich environment. The above would be (is) a problem even without CO2 fertilization. Best practice sounds like rotating crops and herbicides at the very least, if not also ploughing and tilling. It sounds like you should be a farmer. You certainly claim to have all of the answers, gleaned from your politically correct sources. Or, you could let the folk with their own dollars on the line, make their own decisions, what a concept. Spoken like a true partisan, right down to putting attitudes in my head and words in my mouth which are not there. I care more about factual correctness than political correctness. Herbicide resistance is consistent with what I know about antibiotic resistance. As in it happens, often, with sometimes dire results. Farmers put their own dollars on the line on the advice of Monsanto’s marketing department, not me, which in some cases has ended badly for the farmers. As I rely on agriculture to survive, I have a vested interest in the agricultural industry remaining viable and not overly expensive. As their consumer, it is in my best interest to be informed about the current and possible future states of their industry. As I don’t have all the answers, or even most of the answers (and never claimed to, hence the literature citations), I would rather farmers make their own informed decisions about how best to do it. Though free-market lessons can be harsh, they can be effective. I would further hope that Monsanto does not exempt themselves from the same learning process. george e. smith – – I once read that, “A weed is a plant where you don’t want it.” Examples like “rose bushes in the corn fields” and “corn stalks in the tulip beds” were given. Glyphosate/Roundup is what of the most lied about substances in the world, although it trails CO2 considerably in that regard. They just can’t bear the thought that increased CO2 is good for our planet. The increased greening “might” be bad, and besides, increased warming “will” offset any benefit. Don’t be to hard on the poor chap. He’s doing god work, but needs funding, so he must ad some buzz words to please the money train. That doesn’t make his waffling around any less disgusting. Do whatever it takes for the funding. The end justifies the means. Wait a minute. The “waffling” may be to get published at all. How many benefits of increased CO2 studies have you seen? I’ll take some bowing to the prevailing paradigm if it gets it out there in the peer reviewed record that increased CO2 isn’t all bad. What they can’t stand is how the increased carbon uptake changes affects the models “reliability.” Not only is all that “green” newly fixed carbon, it also indicates water that is no longer water vapor. In deserts the chief source of water sources are night time condensation, so that is water vapor whose warmining effects are not being amplified by atmospheric CO2 in the manner assumed by AGW models. Instead, it is amplifying the fertility of deserts. If we had genuine proof that increased CO2 helped plants, and proof that drought and hardship decreases with a warmer earth, they’d still claim both were catastrophes. Of course, we do, and they do, so this is no epiphany. trace gas.. can’t do anything. magic gas…does everything one’s opponent wants it to, everything one hopes it won’t, and nothing anyone can agree upon. Carbon pollution … Killing hapless photons. Naw, it just recycles them. Very green in that respect. Mosh….at what level does your stupid trace gas become limiting? Mosh: we are talking about plants, or haven’t you raed the article before commenting???? Are these the words of a scientist or an environmental activist? What could possibly be wrong with turning barren landscape green? Life is all about change; it’s only with death that change ceases. They are the words of a scientist telling CAGW faithful that the devil is making deserts green. “Good” and “bad” are not scientific concepts. It’s not for him to cast moral opinions in a supposed scientific treatise. In that case he ought to have omitted the words “we don’t necessarily know if that’s a good thing or not.” By including those words he is deliberately introducing moral questions. I guess it depends on what particular shade of green it has become whether or not it’s a good thing. That is just the sort of sentence a reviewer, aware of the implications, would require inserting because the paper does not prove that the (inevitable) result will be beneficial. The authors didn’t intend to, of course, but people reading it (like me) may interpret the greening of dry lands beneficial to humanity and the planet in general. In order to point out that this was not conclusively demonstrated, the warning was probably demanded by the reviewer’s comments. American scientists seem to feel which way the wind is blowing in the coming election and are now starting to sit on the fence when it comes to CAGW exaggerations ! Take note that OCO-2 NASA science teams are eerily quiet. The paradigm of anthro-CO2 as the source of +2.2 (+/-0.3) ppm/yr pCO2 is going to fall within 10 yrs. This is what happens when you enhance the base of the food-chain. So, increased primary production is a bad thing? It is if your livelihood depends on the cause of it being a bad thing, certainly. Did it not occur to these geniuses that increased greening would enhance the production of biofuels and hence decrease the need for fossil fuels? Not to mention increased greening is due to CO2 being removed from the air. They are not sure if their devil gas being removed is good or bad? Or they did not realize that this was occurring? I have a question for Appell or the study authors or anyone else who asks if or how we know if a greener globe is a good thing or a bad thing: How do we know if a warmer world is a good thing or a bad thing? I guess they couldn’t go a bridge further and state that this will cause an exponential growth inwards from the present greening (additional soil water and shade to promote the next concentric ring of new vegetation) resulting in ever increasing sequestration of CO2 as the early plants grow and the renewing fringe expands. 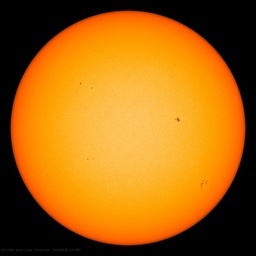 Ya know, we may end up with an equilibrium CO2 content in the atmosphere with no curtailment of fossil fuels, snipping off the problem they are worrying about. Where are the frkin biochemists/botanists, they aren’t going to listen to an engineer. With my new theory of irony in climate science, I have a strong suspicion the equilibrium reached will be 350ppm!! You cannot “snip off” a problem that does not exist. Even pretending that CO2 is a problem is an insult to science, Earth, and all honest educated people. It’s so cold in Northern Canada the squirrels are freezes their tootsies off ! Interviewer: Tell us about the work. Bennie: Well, the water is cold, so very cold. But mind you we didn’t get any extra pay. Interviewer: I see. So your increments were frozen? Bennie: Frozen? They very nearly fell off! CO2 is greening the planet?!? You mean that evil gas that Obama and the EPA are trying to declare a “pollutant”? And the same colourless, odourless, trace gas that kids at school are being taught to refer to as “carbon pollution”? Carbon dioxide, greening the planet?! Shock horror. Yes we do. It’s 99.9% good with a confidence level of 90%. As I’ve said many times, people with PhDs are often abysmally bad at the big picture or even any kind of context. This is exemplified by folks like Mike Mann who are so illiterate that they can even imagine trying to erase the MWP. The light came on for me when I was much younger. A holocaust denier did a scholarly paper on the gas chambers at Auschwitz. He did all kinds of measurments and calculations and ‘proved’ that they could not have been gas chambers because they were too leaky to be effective. If I didn’t know anything else I might have been convinced. If you can focus narrowly enough, and ignore the rest of reality, you can prove anything. Anthony. Did I miss it, or did you once again post an article without a source link? that the true concern is the increase in insects which this “global greening” will bring. More carbohydrate AND more protein. We are in serious trouble. Well, Thay U.N. guy did say we should all eat more bugs !! Him first . . . unless he means lobsters. I’m ALWAYS willing to eat more lobsters. The “no grow” aCO2 level for most plants is around 200ppm. This means that increasing the aCO2 from 300ppm to 400ppm, is essentially doubling the available aCO2. No wonder the plants are LUVIN’ IT. Do any of you “scientists” understand photosynthesis?? Without CO2 all green things die. Deciduous trees, pine trees, your wife’s potted germanium in the window, corn, etc. Then of course, cattle, sheep, etc., because they no longer have feed. After that, guess what? Humans die because they have no source of food. Good God, I’m surrounded by idiots. Even a first year high school student who has passed a biology course (the two are not mutually exclusive) knows that. That’s my thought too, only going back to kindergarten when we all learned that plants “breathe” out oxygen that we need and we breathe out CO2 that plants need. Did they ever talk to a greenhouse operation and how they pump in extra CO2 to make their plants grow faster? Warmer and greener is better for everyone – plants, animals, and humans. Cold and dry is bad, kills lots of plants, animals, and humans. They should pay me the research bucks! Yes, OregonBuzz – and that is one of the reasons (probably a major one) why global food prices are so low right now. We have miles of surplus grain – and “we are swimming in milk”; so I heard from the world media today. With the help of a bit more CO2 we could easily feed a billion more people. All true, but the EPA still claims on the strength of a 1970s era law, vast new regulatory powers to deal with this “pollutant”. They have been very briefly stopped by a 5-4 Supreme Court decision. Now, one of those 5 justices has died, and is likely to be replaced by a big government believer. It is astonishing how insane our public culture has become. In the seventies in the Sahel cattle and people were dying massively because of the drought. ‘Desertification’ it was called, the Sahara desert grew southwards with a fifty kilometres a year. We ALL knew it was bad. Now when the Sahel is greening, someone is doubting whether that is good? The rarest critter in central and northern Canada is a brass monkey. The squirrels are fine. I’m sure the alarmists will now go with an “endangered deserts” rant. Lets see now: Higher CO2 makes it easier for plants to use CO2 > that results in plant growth especially in ‘dry lands” (as defined) where several billion people live > that results in 15% water retention in those dry lands >> it therefor follows that the worlds oceans will not rise due to hypothetical melting of the polar ice because all the extra water will be retained in the dry lands instead. From the southern wheat belt in Western Australia, you know, the place with depleted acid soils. Just sayin’. Despite a rainfall of only 40% of long term average…we took off an oat crop of 3T per Ha. I wonder what it would have been at 250ppm CO2? Recent Australian research by University NSW and Melbourne University has found the 5 decades from 1950 to 2000 to be amongst the wettest periods in Eastern Australia in the last 500 years. In addition the five worst drought years in the past 500 years all happened prior to 1900. Climate scientists elsewhere also see an increasing fire risk as CO2 levels increase resulting in greater growth in vegetation providing higher fuel loads. Good or bad, here I thought most “vegetation” (on at least this planet) was green. If CO2 was increasing AND the size of deserts were also increasing, the CAGW crowd would be wildly cheering on that man-made destruction of the environment. Bunch of sick bastards. Let us name their condition Environmental Hypochondria. They want the earth lying in a hospital bed stuck with a million tubes and nothing less will satisfy them. They need sickness in the environment in order to feel good about themselves. Bunch of sick bastards. Eugene: those tubes are not empty, they are sucking the money out of the host. A clear case of terrestrial Munchausen by Proxy. So after telling us for years that CO2 is causing desertification and that’s a bad thing, now they’re suggesting that de-desertification is a bad thing. Gee, I guess you can have it both ways! How does increasing CO2 affect tree rings? TedL: You would have to ask the genius ‘Mann scientist’ who has aced the study of tree rings. Only he is qualified to answer your question! A good point. Specious CO2 fertilization correlation has always been one of the many serious problems with using tree rings as thermometers. Perhaps the oil industry has become “green” and Greenpeace needs to change its name to the Brownies or the Bedouins. How much longer will CAGW be taken seriously??? CAGW is a complete bust.. But SCIENCE is HARD, and that’s BORING when the warmistas can have so much FUN scaring all the little sheepsters half to death! Remember those guys who used to stand on street corners in goofy robes with signs that said The End Is Coming? Well, we should pay this batch the same amount of attention. Can someone tell me where “deserts” comes from in this? Greening of vegetation – fine – extra CO2 would do that. But deserts are rather short of vegetation …..
No mention in the original paper either…. Generally areas that receive less than 250 mm [10 inches] of rain per year are considered deserts. The amount of evaporation per year effects how “deserty” a desert is. Much of what is considered desert in Australia is well vegetated…….but by plants that tolerate arid conditions and intermittent rainfall. When it does rain heavily, every ten years or so, it often floods. Reposted this on my German KlimaWandler.blogspot,com site with some personal musings. Sour grapes? Or something clever like this: if we spread the notion that it might not be good then we can continue to write our grant applications with the term “CO2” in it and get at the money. Generally grasslands will be maintained by grazing, but, if the grazers have been removed, such as the BLM’s goal in our Western states, bushes and trees will indeed move in. Ya think? Here in southern New England, if you don’t mow your hayfield for two years it’ll be already converting to invasive vines and weeds; don’t mow for five, and now it’s 3rd-growth scrub timber saplings and you’ll need a flame thrower and a bulldozer to clear it. GRASSLANDS are our fastest-disappearing habitat due to the selling off of former farmland for suburban sprawl. Don’t forget, ocean phytoplankton also benefits from increased CO2. They are struggling very hard to find some possible explanation why increased vegetation caused by CO2 will be a very bad thing and therefore yet another reason to reduce the ‘infernal’ CO2. They will not find it. Steve, somebody that clueless probably couldn’t figure out how to reproduce, and that’s definitely a good thing. This from 3 years ago…. When will Mankind start to take bows for averting the truly Global Catastrophe of CO2 Plant Death. The Plant Kingdom had succeeded in eating out most of the atmosphere’s CO2 and found themselves stunted in growth as a result,literally starving for more CO2. . But as the atmospheric CO2 level dropped close to the Plant Kingdom death level of 200ppm, when Photosynthesis ceases, the world’s biota faced a calamity. If all the Plants died, it was only a matter of time before all Animals, humans included, died as well. Thanks to modern Mankind’s efforts, the threat of the Catastrophic Global Death Spiral, “CGDS”, has been averted. When clean energy from Wind, Water, Fusion and Fission are adopted, Mankind will have to create a program to feed the Plant Kingdom, by forcing CO2 into the atmosphere. I suggest a program of forest clear-cutting, and creating forest fires, in-situ oil/gas well and coal seam fires, as a start. Thanks Mankind for rescuing the World! Where do I go to get my Nobel Prize?